Are you fond of folk tales and like to play simple games on your mobile? 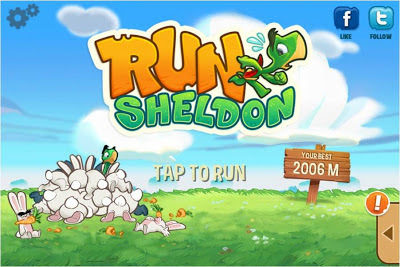 One of the most popularly-formatted games in AppStore, Run Sheldon!, could get your attention. What’s more interesting about this game is that it is based on the old fable on how the lazy hare got beaten by a tortoise in a race. This time the tortoise (named Sheldon) face a bunch of hares sent by his arch-rival to grab the Golden Race Trophy. The premise of the game is catchy in its own right among other endless running games like Jetpack Joyride and Zombie Tsunami. The Run Sheldon game curves it place with its clean cartoon look and smooth gaming interface. It’s definitely worth your time. The gameplay for Run Sheldon! is easy to learn, you just have to tap the screen anywhere and Sheldon will do the rest. This might sound easy, however, there are gangs of hares that’ll block and knock you off along the way. 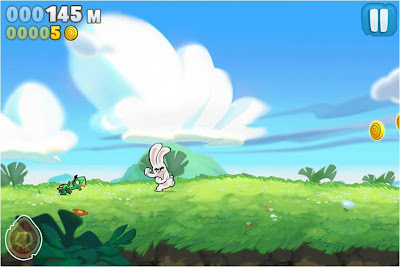 The idea of the race is basically to run as far as you can; there are also missions that you would consider for you to level up. Of course, the game wouldn’t be complete without coins to collect, power-ups and essential items to help Sheldon defeat resistance like gliders, bubbles and several other boosts. The game is free and that’s the best thing about it. However, the premium feel of the gameplay makes it more immersive. There are no annoying ads that pops out anywhere, and just like any other free apps, there are in-app purchases for coins and additional premium items. Good thing about it is that these are not necessary to enjoy the game. Rankings can also be shared with friends via Game Center and your social media sites like Facebook. Graphics are certainly cartoonish, which is a good thing for me. It fits the game experience really well. Likewise, the audio is a tease. It really makes you tag along the experience of Sheldon in the game. Both can pose comparison to other popular games like Angry Birds and Cut the Rope. One of the best things about the app is that it’s a feel good little app for non-gamers and endless runners. Kids would enjoy its cartoony plot. There are lots of power-ups that could help you make Sheldon as the fastest tortoise in town. Besides the fact that the game is repetitive, there are no complains that I could point out. Run Sheldon! is free, so you don’t have to waste anything aside from a pinch of your time. It is an absolutely enjoyable game that’ll challenge your reflexes and deserves a second look among other endless running game powerhouse in the AppStore.